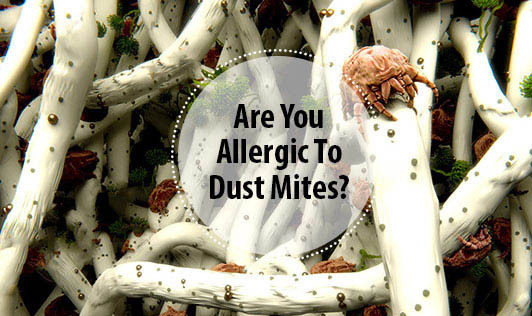 Dust mites are less than a millimeter in size but can cause severe allergies and asthma. These tiny bugs normally live in house dust. They survive in all climates and therefore dust mite allergies are found worldwide. The most common places they live and multiply are in carpets, rugs, blankets, bedding, furniture, pets, curtains and anything fluffly and furry! Symptoms to dust mite allergy include sneezing, runny nose, itchy or watery eyes, nasal block, itchy nose, or cough. In severe cases, it can lead to asthma or sinusitis. Remove / reduce carpets, mats and blankets at home. Allow sunshine to enter your home as much as possible. Spread your bedding in the sun often and change your bedding as frequently as possible. Wash your furnishings, bedsheets, curtains, pillow cases frequently. Do not allow dust to collect in your computers, office drawers, on tables and chairs. Reduce clutter and clean all corners and crevices well. If the above steps do not help in controlling your allergy, your doctor might prescribe you medications to keep it under control.